JustRite Stampers is excited to announce that Release #2 is shipping soon! There are a lot of great new products in Release #2 that coordinate with the other products JustRite has to offer. The JustRite Blog Team has been busy creating some great projects to share with you using these stamps from this release. I created a Coffee Basket Ensemble, using the Basket & Blooms Die from SU, along with the new Just a Little Caffeine Borders & Centers Set 2" from JustRite, to hold an altered coffee cup and package of coffee. I made my basket similar to the one I created here . Except this time my card stock measured 9-1/2" x 7". I did use the same scores of 7/16", 3-1/4", 6-1/4" and 9-1/16". The designer paper is from The Paper Loft, Well Worn Words Tall Tale. To decorate the Box, I stamped the Coffee Beans from Just a Little Caffeine Boarders & Centers in Black Archival on Twill using the Harmony Rectangular Stamper, Black Archival Ink and a SAMJ. To decorate the bag of coffee, I used two pieces of 5-1/2" x 8-1/2" pieces of Ruby Red card stock scored at 2-1/2" and 6", then adhered the sides to each other. I used the JustRite Harmony Rectangular Stamper, the Just a Little Caffeine Boarders & Centers and my SAMJ to stamp the Coffee Beans on the Rose Red card stock as a border. To decorate the wrap, I stamped the Just a Little Caffeine Borders & Centers in Black on Confetti card stock, colored the plate with markers, and cut with Circle Nestabilities. I stamped the image again on a scrap of Tall Tale DSP, and paper pieced it to the original image. This piece is layered on a Navy 1-3/8" circle. I stamped border in Black on Bordering Blue card stock, cut with the Circle Nestabilities, then layered it onto a Navy Scallop. 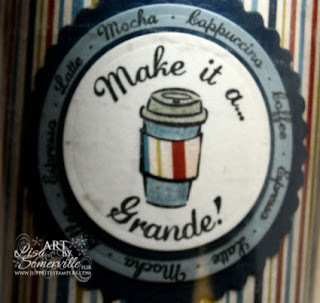 I used my Navy marker to add color to the decorative trim on the plate and cup, and Spica Glitter Pens to color the Coffee Beans on the sentiment. I've had the Alterable Coffee Cups in my stash for quite some time, an old find from The Dollar Tree. The center is stamped in Black, colored with markers, and paper pieced with Tall Tale DSP. I cut these pieces same as in the above post, just changed the Border image. So fun! I LOVE the paper piecing and your boxed set -- very cool idea!!! great coffee set. Would love to have that waiting at my door. 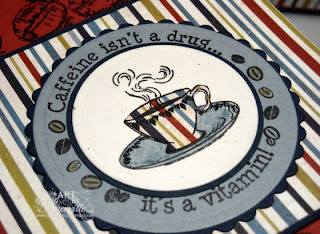 I'm not a coffee drinker, but I have friends who would love to get this card I think! Great colors, and such a fun set, Lisa! I can always count on you for some neat gift idea! Great gift set. This coffee set can just be used for everything. LOVE the twill, and the paper is a perfect choice for the set! LOVE it! Looks like we both had the same thinking going on this week, Lisa! 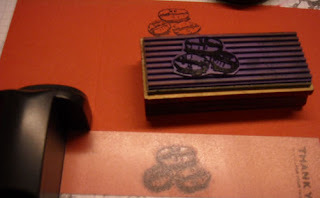 Too funny that you showed the cut center and stamp positioner trick, too! Love your paper pieced cups! What a great looking set - the paper and stamps look so great together!! Thanks for the inspiration!! 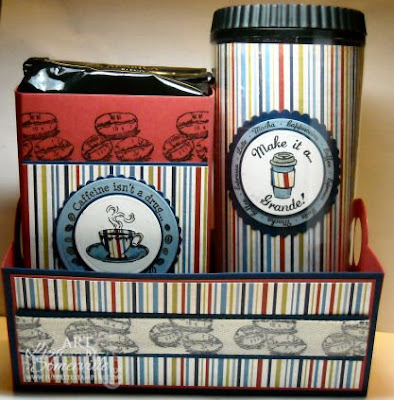 What a fun coffee gift set - love the striped papers and the great box! Great gift idea! Love the striped paper. Awesome! I don't know anybody who wouldn't love this gift! Liking this gift set LOTS! Thanks for sharing it. This is perfect for the Coffee Lover! I love the paper piecing too! Thanks for sharing! love, love this gift set! Wanna sell it? Great job! It is amazing what you can find at the dollar tree. You did an awesome job. Lisa, who wouldn't love to get this totally decadent set! This is fabulous, and you have me dreaming of coffee now!! Lisa, I love your Coffee gift set! Fantastic papers and colors! Love the paper piecing too!! loving these cafe stamps! would really like to get my hands on them!